Crew products are safe and effective on chrome, ceramic, porcelain and stainless steel restroom surfaces. Leave guests wondering if your crew ever rests. 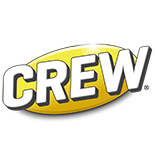 Crew® Bathroom Disinfectant Cleaner is a one-step cleaner, deodorizer, and disinfectant that powers away soils, soap scum, and hard water stains. When toilet bowls and urinals get soil buildup, Crew® Clinging's thick liquid formula dissolves even the toughest of stains. Let’s face it. No one loves to clean the bathroom. While we can’t eliminate the need to clean, you can make it easier, faster and more effective. Scientifically formulated surfactant block eliminates odors. Continuous release controls malodor and helps prevent mineral build up.